P. S. I used water instead of wine. Very tasty salad with grilled halloumi cheese. Soak onion in water to remove bitterness. 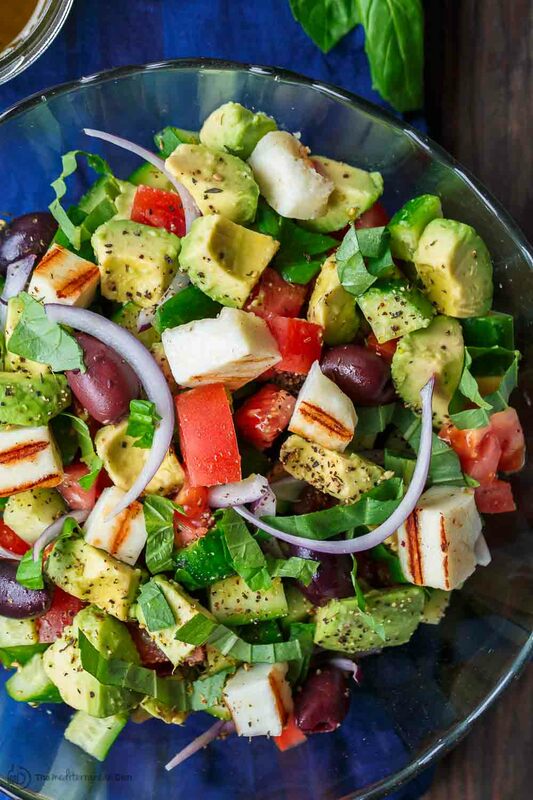 All-star Avocado Salad Recipe, prepared Mediterranean-style with cucumbers, tomatoes, and other Mediterranean favorites! Tossed in a zingy garlic vinaigrette with a generous pinch of za'atar. Add decadent grilled halloumi cheese in place for croutons, or leave it out for a vegan option. Vegetarian. Gluten Free. This looks outstanding, though I personally prefer to skip olives. I love the color pop in your photo as well. Try to fry the adyghe cheese in a frying pan with oil. @ivan zlax I use this cheese in shavarma!